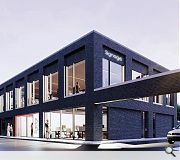 Clyde Gateway have unveiled their latest Bridgeton intervention in the form of a two-storey office pavilion at Landressy Street. 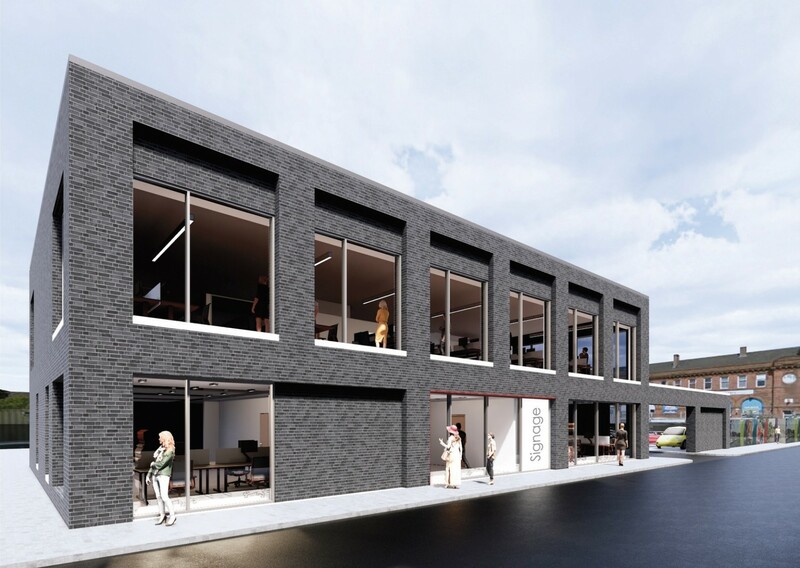 Design proposals by Keppie call for the creation of 6,450sq/ft of open plan office space in Glasgow's east end together with associated reception space, meeting rooms and a research library. Deferring to the conservation area the design approach seeks to pick up the ‘rhythm and materiality’ of neighbouring buildings through use of dark stock brick similar in tone to the recently completed Women’s Library. Explaining this approach Keppie wrote: “We felt that the proposal should address and relate to the Women’s Library façade opposite so should have a prominence to the south of the site. Large format windows will be faced in contrasting light coloured sills extending through an extended ‘wall device’ to extend the street frontage and frame a private courtyard. Why do so many new buildings in Glasgow fail to address the street they inhabit? Why do they reject the street- in doing so reject urbanism? This is a site just over a mile from Glasgow X, & located in a context of antecedent urban fabric- why do the architects feel the need to ignore that fact? 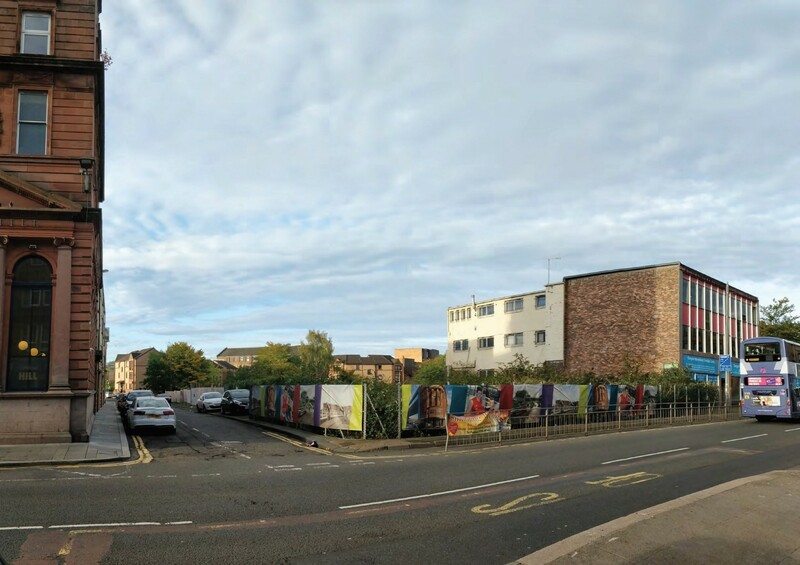 topological structure designed to reconnect Abercromby street/pull in Gallowgate with London Road at that specific juncture...instead we get a 1987 single storey tin shed that would be out of place in Linwood. That in a nutshell sums Glasgow up. No joined up thinking. No self-confidence that in turn has created a crisis of self-identity where we see the same errors continually repeated. These junctions are breathing spaces where the a manifold web of urban connections exhale in a revelry of communication ie signage, a corner bar, cafe, commerce or hubs of connectivity etc all combine- people inside want to be immersed in the street, people outside want eyes on them to feel safe. Its that simple. We see this pattern repeating in the plans for the Crown Street development in the Gorbals, with the main intersection at Caledonia Road rejecting urbanism & repressing itself as some form of negative space- why? This seems to be the legacy of modernist planning- aka as a rejection of pre 1920/30s urban design formats. The 'designing streets' 2010 policy released by the Scottish government has been utterly ignored time & time again- where are the tried & tested legible streets that characterise the best of integrated urban fabric in Scotland? The future much of the time can only be found in the past. The site was previously the Keystane pub (which went on fire! )and a beautiful big block of tenements(which collapsed). The ugly office block next door should have been demolished and the whole site redeveloped back up to tenement sized buildings. I`m not angry at the office development it`s ok(ish) but just not on that site. I used to live there and the 2 tenement blocks formed Landressey St in to a nice wee lane (good roll shop in the collapsed block). I just think it`s a shame as more could be done with this site to bring back more people living there and life back to the area around Brigton x. Even if the office building incorporated more flats and shops above it and next door to it that would be better than a 2 story office block and a car park with views to the dilapidated slum offices next door. Sorry for having a moan, as people will have worked hard at this project but I used to walk through Landressey St everyday on the way to work and it makes me sad to see what has become of it in such a short period of time. Wonky - all good points, but I can’t help thinking you could have said it in half as many words. ‘Manifold web of urban connections.’ Jeezo. 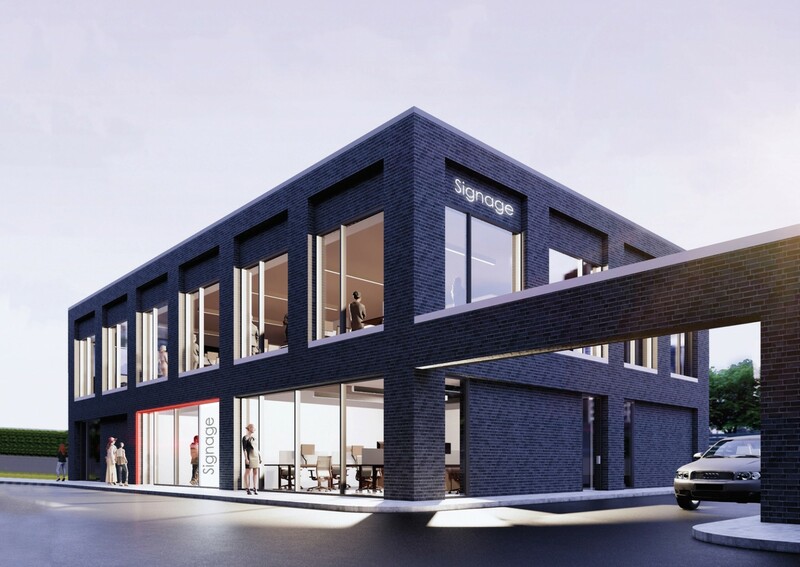 Totally agree with the above comments; however after my initial disappointment from the proposal, in particular its interface with London Road, I am somewhat relieved after looking at the drawings on the planning website. 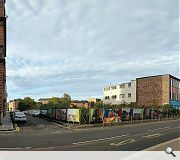 The site facing London Road does not form part of this application, and will hopefully be built on in the future at a more appropriate height and density, akin to a street frontage on a key arterial route in central Glasgow. I don't mind this proposal, yes it could be two or three floors higher and I'm hoping the remainder of the site (facing Anson Street) will be developed at a later stage, as this proposal seems to utilise just half of the area under Clyde Gateway's ownership, but as proposals go its not too bad, decent sized windows, an active street frontage to Landressy Street (albeit only during office hours I'm assuming) and a decent material palette. Don't know if any you guys #4-5 have heard of a social phenomenon called civilisation? The zenith of its accomplishments, indeed the source of its knowledge, comes from a system of human communication we call 'language'. Civilisation evolves by means of a constant refinement of its language systems for the purposes of communicating sophisticated concepts and to promote the exchange of ideas. Its nothing to be afraid of, really. In fact it can expand your awareness of human experience & equip you for the modern world. You both ought to try it. I hope you both catch up soon & can add something of substance to any exchange of ideas in the future. Good luck on your journey. Love, Wonky. Funny, here's me thinking that a fairly important part of architecture is the ability to communicate ideas using as few words as possible. Very poor -- whoever has designed this has tried hard but it offers nothing beyond the obvious. Inner city are now with the street front being downgraded to parking -- you get the impression that Bridgeton is being abandoned by the city establishment. Why spend money on refurbing the GWL and then putting this across the road. Inner city farming this way comes.